Architecture is a popular photography subject, and one that can be explored both right around you and when traveling. This post will cover a common problem in architecture photographs: distortion due to perspective and the focal length of your camera lens. Perspective is critical in photography and perhaps no where more so than with architectural photographs. Our brains use perspective 'cues' in two-dimensional pieces, like photographs and paintings, in order to interpret the three-dimensional views represented. We are used to the idea that a road seems to get smaller as it fades off into the distance, even though we know that it is actually the same width all along. 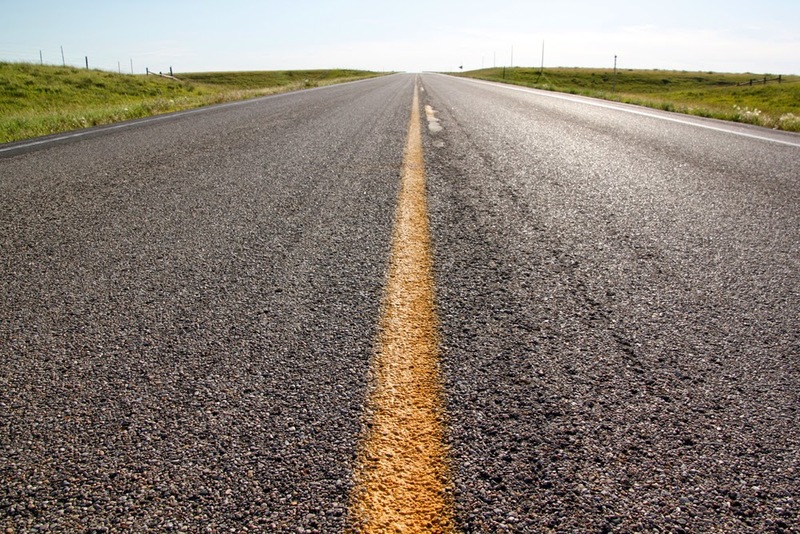 These vanishing points (the point either within or outside the image where the two lines of the road would converge) help us gauge distance and scale. But they can also be disconcerting when they create distortion in places where we expect lines to be straight. The amount of distortion in a photograph depends on the focal length of the lens used and on how close or far you are to your subject. In a previous article, Zooming vs. Cropping: perspective in photography, I provided one series of examples about how focal length and movement can change and distort an image. Below is an architecture example comparing zooming from the same place. Here, I took two different versions of the same picture, while standing in the same location. First, I took a wide angle view at a focal length of 18 mm, and then I took a zoomed in view at a focal length of 110 mm. When you compare the Capitol between the two pictures, you will notice that there is very little difference in the images and their relative distortion. The problems arise when you start moving and changing your focal length together. The road fading into the distance illustrated the idea of 'converging verticals' - that vertical lines in the image appear to be getting closer together rather than being straight up-and-down. While this can work well for roads, it is not always the effect you want with architecture. The graphic below demonstrates some examples of converging verticals at different focal lengths. For this series of photographs, I composed each image to include approximately the same composition of the Capitol building. Then, each time I changed focal lengths, I had to walk farther away until I could get the same composition. Overall, I walked about two city blocks between the nearest and farthest shots. The distortion of the converging verticals is most apparent at the wider focal lengths. Many photographers intentionally use wide angle lenses to create this kind of vast, overwhelming feeling of size through distortion. By the time you approach 50 mm, the verticals have mostly straightened themselves out to give a more 'realistic' or standard architectural view of the building. The distortion from taking a photograph of a building from up close is not limited to converging verticals. Horizontal lines can also appear significantly exaggerated, depending on your lens and location. For this version, I have included two additional focal lengths, as the horizontal distortion is still evident around 50 mm. As with the vertical lines, the distortion is most apparent at the wider focal lengths. The side wings of the Capitol building appear to head off at much higher angles in the 18 mm photograph than in the other versions. Because the building wings are being photographed at an angle, they will never appear completely horizontal unless I moved to one side or the other and shot them face-on. Again, as with the vertical distortion, you need to be aware of the look that you are trying to capture and either use or avoid distortion as it fits your photographic vision. The key lesson is to keep both horizontal and vertical distortion in mind when photographing and especially when capturing architecture. 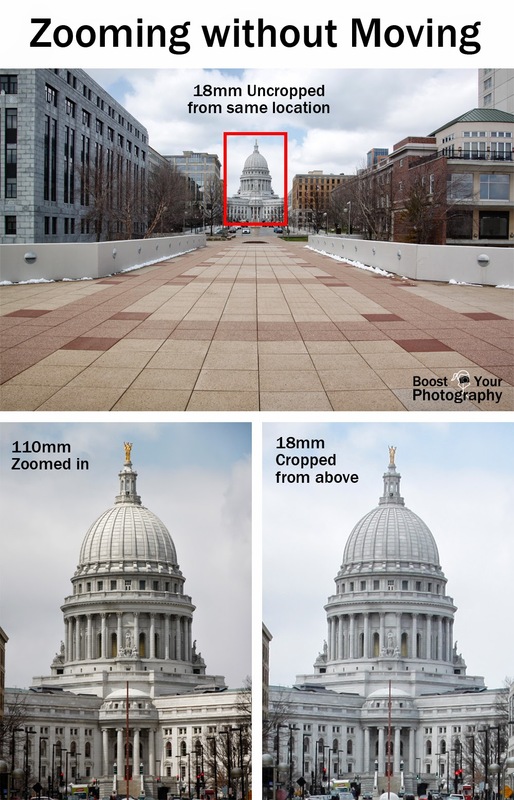 If you are looking to represent a building in an accurate, less-distorted way, then you need to think about using a longer focal length (over 50 mm at least) and standing much farther away to get the composition that you want. If you want, instead, to convey a feeling of height or soaring proportions, then using a wide angle lens and getting as close in as possible will help get that feeling across by utilizing vertical and horizontal distortion. Neither image is 'wrong,' but you want to use distortion intentionally, rather than just clicking a quick snapshot of a famous landmark from up-close and then being disappointed when it looks awkward or unusual when you get home.